Hello, all. 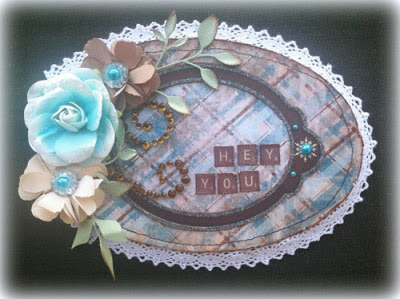 I've been super sick with pneumonia, so I haven't had a chance to post my projects I made this month with fabulous Flourish with a Bling products. By the way, FWAB is now selling their products directly to you on their website! Check it out RIGHT HERE. Awesome news, right?? Every month on the Swirlydoos Kit Club forums, we have a Round Robin Card Challenge, and it's one of my favorite challenges. This is my submission. 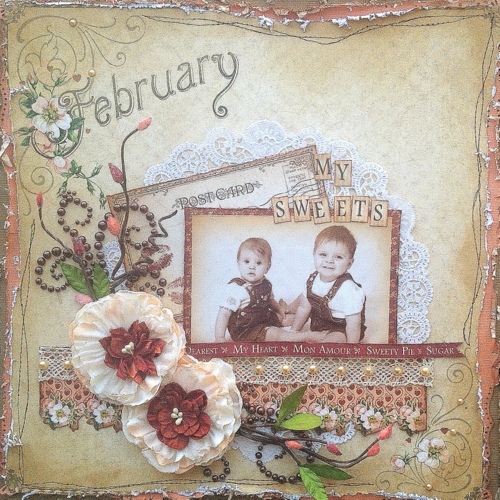 My week was week three, so two very talented ladies "went before me" and this is my adaptation of Patty's and Steph's cards. The twists were that the card could not be square, and we had a color palette to work with also. Okay, so this one is doing triple duty. I'm also using this layout for the sketch challenge at Swirlydoos, and also for the Groundhog Day Challenge there- the idea is to take an old layout that you think could use a re-do, and make it better. I used the FWAB Latte pearls to accent the flourishes on the paper, and also on the lace. And, one of my favorite ways to use the flourishes- popping out from under flowers and vines- I LOVE that look. I used the Grace flourish in chocolate. Gorgeous projects, Rae!!!!! I'm so in love with your "Sweets"!!!!! !